185 gram bars & 25 gram bars NOW available! Leaves your hands feeling fresh, smooth and clean. ON LINE SPECIAL PRICES AVAILABLE! ASK ABOUT A BOX BUY! CRA-Z Soap will change the way you think about hand cleaners forever. economical and a very safe. Check out the following facts about CRA-Z Soap. FACT 1: CRA-Z Soap contains no petroleum or pumice. Petroleum and pumice are common to other hand cleaners. Petroleum and pumice clog pores and damage skin. FACT 2: CRA-Z Soap's formula is "skin-friendly". CRA-Z Soap removes the toughest dirt, grime, grease and ink. CRA-Z Soap won't clog pores. Skin can breathe and heal itself. Hands feel smooth and fresh. FACT 3: CRA-Z Soap delivers satisfied customers. Over 3000 field tests prove that customers love it. FACT 4: CRA-Z Soap is fabric friendly. CRA-Z Soap is also a excellent stain remover. Use it on your carpet or clothing. It does NOT damage the fabric. "I love the soap, I normally hate to 'sell' things even for other people, but I was so impressed with this product that I have no problem telling people about it. I feel like I'm doing them a favour by telling them about it. I do a lot of crafts and it doesn't hurt my skin." "I found this product years ago and have been a faithful user ever since. I am an outdoor person, who is not afraid to get dirty, whether it be grease, paint, or if I am out with the guys fishing. This product gets my hands clean. It removes the fish smell, takes away the grease, and doesn't leave a residue. My wife has used it recently to remove a stain from her blouse, and insisted I order some for her laundry room. Just store your bar of soap somewhere handy, in a DRY location, and it will last for weeks." "CRA-Z Soap is a staple in our home!! I was given it as a stocking stuffer many Christmas's ago and was thrilled on how it cleans what nothing can. 4 years went by and my bar was getting too small for use so began the hunt for another. I was to the point of trying different products with no success so resorted to the wonderful internet to see if I could find CRA-Z Soap somewhere. I was thrilled to see it available online. I could not simply order 1 bar so decided everyone would get crazy soap in their stocking for Christmas. 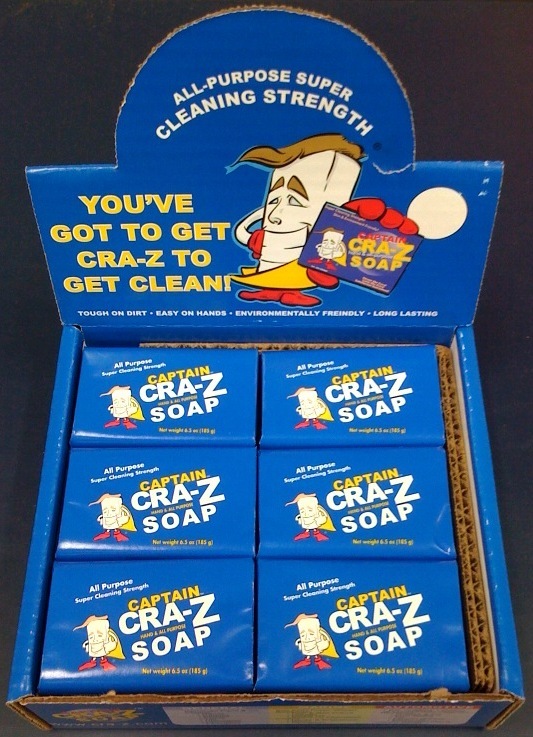 Whenever anyone says they have 'something' that they cannot get clean - my answer is simple - Use CRA-Z Soap. I am ready to order again and will easily order more to spread it around. Everyone should have it in their house!!!" "Just to let you know we think this soap is wonderful. We had never heard of it before. We got grease and dirt all over our jeans when working on our vehicle. We thought that we would have to throw them out, they were so bad. We were shown this soap and just rubbed it on the stains; threw the clothes in the wash and they came out totally spotless. WOW! Just to let you know we will be telling others about this wonderful product." " I feel like I have tried every product available for cleaning hands. Me search is over. This soap is by far superior in every way." "We really like this soap, it's the best we have ever used and it's tough on dirt, easy on the skin." Now available to order On-line! Cra-z Soap simply the best! Click the below link to order! ORDER YOUR CRA-Z SOAP HERE!